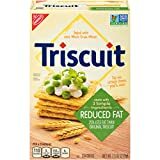 Triscuit Reduced Fat Crackers, Non-GMO, 7.5 Ounce (Pack of 12) - Be Happy Dieting! Triscuit Crackers start with 100% whole grain wheat baked into each delicious woven cracker. 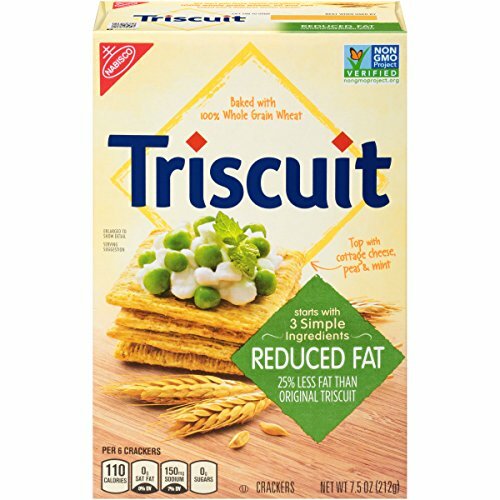 Triscuit Reduced Fat Crackers are a good source of dietary fiber and contain 2.5 grams of fat per serving: 25% less than Original Triscuit. These crunchy crackers are great on their own or with your favorite sweet or savory topping or dip. Triscuit Reduced Fat crackers are a great complement to meats, cheeses and vegetables of your choice. This includes twelve 7.5oz boxes of Triscuit Reduced Fat Crackers.